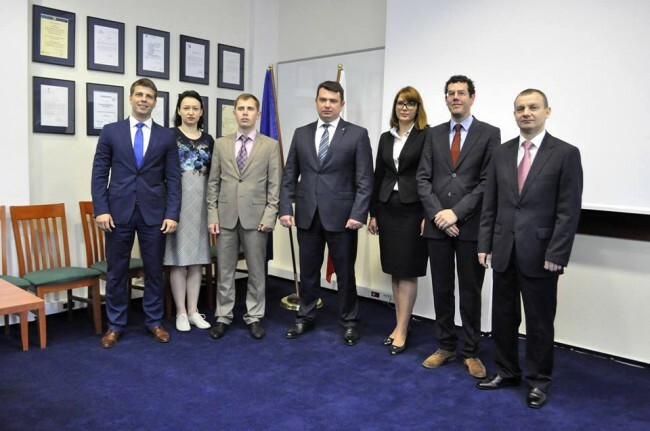 During a study visit to Poland organised by EUAM last week, the National Anti-Corruption Bureau of Ukraine (NABU) signed a Memorandum of Understanding with the Central Anti-Corruption Bureau of Poland (CBA) – the first time NABU has signed a Memorandum with the anti-corruption agency of another country. “The Central Anti-Corruption Bureau of Poland is the closest to the NABU in terms of its structure and functions, hence it is places best for sharing experience with NABU,” said Artem Sytnyk, Director of NABU. The purpose of the study visit was direct exchange of experience with counterparts at the CBA regarding organizational management and mutual cooperation in the implementation of investigative, operational, control and analytical activities and strategies for investigation of corruption cases. During presentations and bilateral working discussions, participants particularly focused on training capacities and career development tools, possibility of sharing expertise and deepening co-operation regarding malware. Also the importance and effectiveness of independent wiretapping competence was discussed. The Memorandum of Understanding emphasizes cooperation in information exchange regarding analytical notes, results of researches and other materials related to investigating and prevention of corruption offences. “It is important for NABU to increase its co-operation capacity with other law enforcement and anti-corruption institutions. This will enable it to rely on an extended regional and international network for effectively conducting cross-border investigations,” said Clemens Mueller, Senior Anti-Corruption Adviser of EUAM. CBA was established in 2006 as a special service within the Polish government that reports to the Prime Minister of Poland. It deals with identification, prevention and detection of crimes and offences, prosecution of perpetrators as well as control, analytical and preventive activities. The activities of CBA proved to be effective, as the Bureau has already successfully investigated a number of high-level corruption cases. “We feel honoured that the Ukrainian anti-corruption service will be built on the experience of the CBA,” said Ernest Bejda, Head of CBA.